Book Review: Doris Lessing Teaches Me a Lesson? 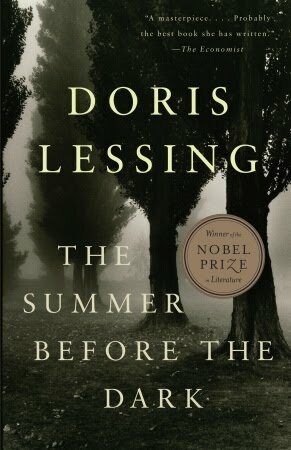 In 2007 Doris Lessing won the Nobel Prize for literature, but until this month I had never read anything by her. I knew that she has written The Golden Notebook, but I didn’t know anything about it or Lessing. So when I came across a cheap pulp edition of The Summer Before The Dark, I thought it was time to acquaint myself with the Nobel laureate and it would be a good book to take with me on our vacation. Written in 1973, The Summer Before The Dark is the story of Kate Brown, a married, empty-nester in her mid-forties. She finds herself alone for the summer as husband and kids scatter to pursue various interests. On short notice she is drafted to assist a friend of her husband who needs a translator for a month-long conference he is holding in London. Kate quickly proves adept at the work, makes herself invaluable to the organization without even trying, and gets paid a salary almost as big as her doctor husband after years of being a housewife. Kate’s sudden and unexpected success in the workplace made me think that this was going to be a particular kind of story of positive transformation. A “housewife discovers hidden talents and surprises everyone” kind of story. And frankly, this is one of my favorite kind of tales. But alas, Kate’s transformation turns out to be much more torturous and complicated than that. After helping organize a conference in Istanbul, she finds herself traveling through Spain with an American man about ten years her junior. Hoping to avoid the touristy parts of southern Spain, the American keeps pushing them inland only to end up seriously ill. Kate does her best to make do with the complicated situation but her facility in French, Italian, and Portuguese are of minimal help to her in rural Spain. And traveling with a man who isn’t her husband puts her at silent odds with the people in the small village. As Kate begins to show signs of the same unknown malady as her traveling companion, she makes her way back to England where she checks herself into a Bloomsbury hotel rather than a hospital. Although never dangerously ill, she has a physical and mental meltdown that leaves her incapable of functioning for some weeks. Eventually she rents a room in a flat occupied by Maureen, an angst-ridden twenty-something who is confused about her own freedom and whether or not to get married. While she is living with Maureen, Kate makes her way back to a degree of normalcy and the book ends with certain amount of hope if not outright resolution. One of the themes I found particularly interesting, because of my proclivity to whine about my own existence, was the way Lessing juxtaposes comfortable middle class life with others in the world who struggle merely to live. Kate works for a non-governmental organization that focuses on global food policy and she is startled by how much she and others in the organization are paid and how much money is put into conferences that might be of little value. Especially troubling to her when compared to economic conditions of the communities that they serve. Perhaps it isn’t a major theme of the book but I identified with what I saw as Kate’s recognition of the self-indulgent nature of upper middle class ennui. It is akin to the moments on MyPorch where my idea of thoughtful introspection and self-awareness gets boiled down by my father (Ernie in Peoria) to self-pity or whining. He is not as blunt as that, but he is essentially right. Privilege breeds whining. The fewer real obstacles one has in life, the more petty the complaints are. I thankfully don’t have to battle illness, or worry where my next meal is going to come from, or worry about being killed by a missile, or not having safe drinking water. I get to sit at a computer and worry about whether or not my life’s dreams will be realized today or tomorrow. One of Kate’s upper middle class struggles is finding out who she is now that she is no longer defined by her children’s wants and needs. When you think of the struggles in the world, this is ultimately a self-indulgent worry. But things in life are relative and it is hard to keep a healthy perspective. One of the things that struck me is that I am almost Kate’s age, but I haven’t raised a family and I have been free to pursue just about every avenue of interest that has popped into my head. The only task in my adult life has been to raise myself. My angst about where my life has been and where it is going seems even more self-indulgent when viewed through the prism of those who have children to care for. Am I trying to say that I should just shut up and quit complaining? Not really. I think it is too much to ask anyone to try and live too far outside of their own existence. And my existence is that of a middle class, childless, coupled, white, gay male in the richest country on Earth. I think a little more balance, keeping things in perspective, perhaps putting a little more of my altruistic tendencies into action, are important things for me to keep in mind. For someone like me who seems incapable of ever being able to decide what I want out of life, perhaps the only things that make the inexorable march toward the grave manageable is the quality of my relationships and the actual process of living. After all, the only finish line in life is death, so I’d better enjoy the run. Next Article But enough of all that, what’s on TV? A really thoughtful review. This is the second time in as many days I have seen this book mentioned – I hadn't heard of it before. Am going to add it to my wish list. I too love a transformation tale! Thanks Tracey. It definitely has me interested in reading more of Lessing's work.